So what is the Cricut Explore Air? As I browsed through the aisles of Hobby Lobby I stumbled upon this beautiful masterpiece. I had no idea what it was, or what it did, but I knew it had to do something great. Today, I am going to save you loads of time because I am going to break down all the information you need to know. The first thing to grasp is what the machine really does. Well that’s the most complex answer. EVERYTHING. The Cricut will take a design already made, or one you created and cut it out on any material you want. It cuts up to 60 different materials! Okay, So How Does the Cricut Work with These Materials? Every project will be completed in Cricut Design Space. So, before starting your first project you will want to create an account in Cricut Design Space. You can work on designs in Photoshop and upload your image files to Design Space, or you can create your whole project in Design space. *Keep in mind you will need a Wifi connection to use Design Space. I use Photoshop for some projects because a few times I’ve run into Design Space being slow, but Photoshop is not required to create beautiful creations. In Design Space you can explore other crafts to make and purchase already designed projects. So yes, you don’t have to be creative to use a Cricut! You can either create your own design, use a free project from Cricut Design Space project list, or purchase a design. You can create your own design using fonts from your computer (or by using Cricut Access fonts, this requires a monthly subscribtion as low as $4.99, well worth the price), basic shapes provided in Design Space, and by uploading images. Once your design is complete, you will put your material on a cutting mat, load the mat into the machine, and press GO! All projects will need a cutting matt. There are three matts that are designed for different kinds of materials. Once the Cricut is done with it’s magic (that is cutting your beautiful design), you will have to remove the material with different tools. This is one step I couldn’t find when researching the Cricut, an easy step, but confusing if you have no idea how the Cricut works. The cutting mat has adhesive for the material to stick and stay in place while cutting. After the material is cut, you use a scraper to peel up your design. If you have an intricate design, you can use the tool called the weeder to help the material from ripping. Don’t panic! It gets easier the more you start Cricutting and when the mat is used a couple of times. Depending on what your project is you will move onto completing your project without the Cricut. For example, a card will need to be folded or you will need to glue different cuts together. For a T-shirt design you will need to iron on your material to the shirt. Most vinyl projects you will transfer vinyl to transfer tape and apply the vinyl to the wall, cups, glass, ect. This is always the bittersweet part of using the Cricut Explore Air machine. The point where you get to step back and observe your beautiful creation with minimal effort. It’s always when I am excited to share what I’ve created and when I want to create another masterpiece! Are you a busy mom? Don’t feel like you have time for crafts? What Can I Really Do with the Cricut Explore Air? Iron-on’s for pillows, T-shirts, mugs, backpacks, ect. Vinyl projects for decal walls, windows, ornaments, cups. Home Decor-wall art, lamp shape designs, paper flowers, ect. Or you can plan a stress-free YOU time with cute already designed projects you can buy for as low as $.99-or several FREE projects. *For a FREE already made design you can check out mine here. What is a Cricut Explore Air? The Cricut Explore Air is one of the newest machine on the market. The big seller on the new machine is it has a dual cartridge, like the original Explore, but it also has Bluetooth so designing anywhere is easy as pushing the Go button. What’s a dual cartridge? The dual cartridge contains a spot for the cutting blade and a spot for a Cricut pen. The pen can write in any font and the pens can be bought in all different colors and sizes. Only Cricut pens will fit in the cartridge. I’ve seen other post about making other pens work, but I don’t want to take the risk in breaking my machine. Choosing the Cricut Explore Air was one of the hardest purchase decisions I have ever made. I hate to admit the main reason why I chose the Cricut brand versus the Silhouette is because of pure branding looks. The Cricut website is more easy and favorable on my eyes than the Silhouette website. Since I have no skill in crafting I needed a brand who would be accountable with showing me the works of their creation, not just in words, but with videos and style too. If you’ve been to the Cricut website you can plainly see the videos are made to fit every person-crafty or not crafty. With my purchase at Hobby Lobby, I received two months free on the Design Space monthly cost (See more here). With my subscription I get emails with cricut how to videos and ideas. Design Space is free to use without the monthly prescription. You will go here to either design your creation, select a new already made project plan, or to finish with cutting your design. Since using Design Space, I have had issues with uploading images and time issues with their website. The machine is definitely better than their Design Space software, but nothing too drastic to void you buying the Cricut. *If you have Photoshop experience you can easily upload your designs to Design Space. When you use Design Space you will need a wifi connection to create, print, and cut. When printing an image you will use design space to connect to the printer. Another confusing simple step I did not understand until I went through it. Upload the image, select print image, let Design Space connect with your printer, print. Then the next step will appear to cut your image. It’s simple I promise! It’s the cheapest machine with the dual cartridge. I’m not limited with where I work. I love being able to write and cut in one step. Okay, I admit, I wanted the newest machine they had. Cricut Access is a monthly plan that gives you tons of already made projects, fonts, and images. You can pay a yearly price making the plan $7.99 a month, or choice monthly for $9.99 a month. Both come with 30,000⍅ images and 30⍆ fonts. Is it worth it? It depends on what you will be using the Cricut for. If you buy the Cricut to make some room for crafty in your lifestyle, then YES get the Cricut Access! 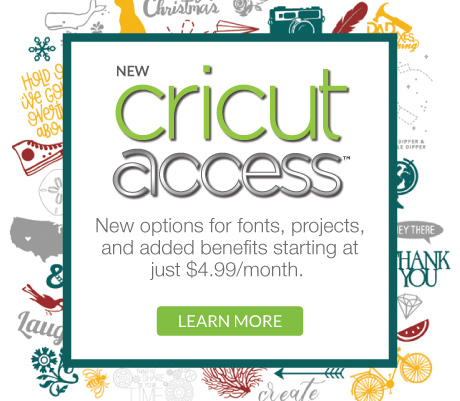 If you don’t want to find FREE fonts and images than the Cricut Access is worth your time. Most projects are Cricut Access friendly. But, not all of them are completely free. A disadvantage to those wanting the get the most bang for their buck. I created a free template in another post. Check out my FREE Cricut template here. Most projects will charge $.99 for certain project images. Not bad considering the time they are saving you, and the headache in trying to make cute crafts! Want to see for yourself? Go check out Design Space to get an idea of what you would be getting and paying extra with Cricut Access. If you already have in mind what you’re going to use the Cricut for, you may not need Cricut Access. If your wanting to start with only making T-shirt designs you can find plenty of free fonts online. I would recommend any new Cricut user to at least try Cricut Access so that they can see all the wonderful things it offers. It’s worth it, believe me! What Accessories Do I Need to Purchase With the Cricut Machine? Overwhelmed by Cricut options and bundles? I know I was! Since I have had my Cricut I have used it for three main projects. Unless you know you are going to be working with paper for cardmaking and other paper crafts, you don’t need the light grip mat (blue mat). I’ve rarely used the purple mat (strong grip mat), but it wouldn’t hurt to have it around. If you buy the Cricut Explore Air, it will come with a silver pen. Not very fun since silver doesn’t show up on anything but dark colors. I would recommend buying a pen set you can use for a variety of projects. I bought black set with different size tips. But, keep in mind the pen set is not necessary. I absolutely recommend purchasing the tool kit. You will use those! Maybe not all of them right away, but who wants to worry about going to the store in the middle of a project? My Cricut Explore Air came with a regular blade, and I’m still using mine five months later. You don’t need to buy multiple blades unless you know you are going to be cutting thicker materials. Here’s the blade for thicker materials-Cricut Explore Deep Cut Blade with Housing. *If you order on Amazon make sure it’s the right blade for your cutting machine. What Does the Cricut Deep Blade Cut? Some bundles come with materials. Mine came with printable vinyl, printable sticker sheets, and materials for the free starter project. Other bundles come with vinyl, cardstock, or pen sets. If you’re trying to spend less you don’t need to buy the big bundle. I still have leftover materials from my bundle kit. If the bundle sets are not in your budget, keep in mind the projects you want to learn first. Maybe it’s playing with vinyl, or cardmaking. Start with an idea and then buy those materials accordingly. For cardmaking you will need cardstock, scissors, and glue. For vinyl projects you will need a measuring tape, scraper, iron (for fabric application), and weeder to start. Before purchasing my Cricut I wanted to get the best deal for the money, but my best might not be your best so here are the different types of machines I have found. You might not know what you want to do with your machine yet, but I hope you find my guide useful. What’s the Difference Between the Cricut Explore Air and Cricut Explore Air 2 Machine? The main differences between the Cricut Explore Air and Cricut Explore Air 2 are speed and cut settings. I haven’t personally experienced cutting time with the Explore Air 2, but the machine is supposed to be faster with cuts. Another thing to consider is the material options. 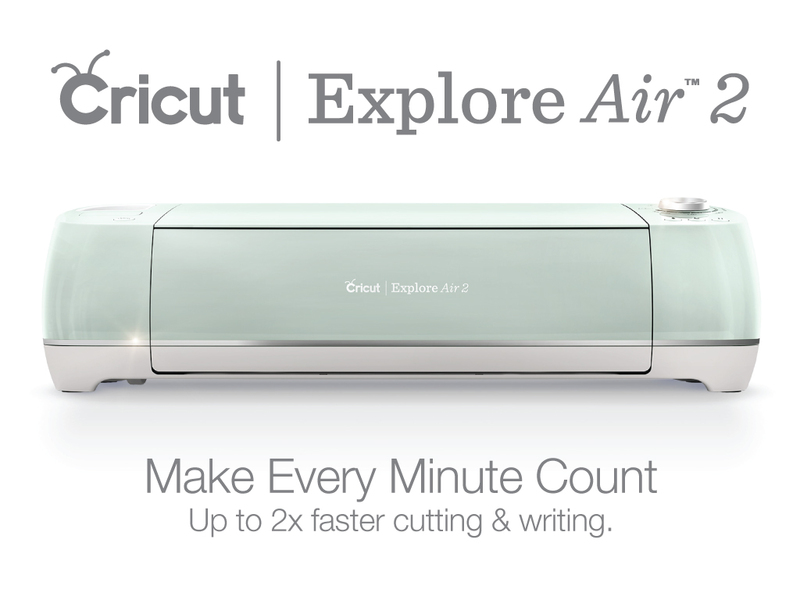 The Cricut Explore Air cuts 60 different materials and the Cricut Explore Air 2 cuts up to 100. Is the Cricut Explore Air 2 Worth the Price? Both machines have the dual cartridge (able to cut and write in the same step) and bluetooth capability. Honestly, since I’ve been cricutting the time for cutting and material option settings are not issues I’ve run into. Let’s just say I’m not in a hurry to upgrade. If you don’t want to spend the extra money for the newest and greatest technology, DON’T! What’s the Difference Between the Cricut Explore Air and Cricut Explore One? The main differences between the Cricut Explore Air and Cricut Explore One are the ability to write and cut in the same step and bluetooth. The Cricut Explore One can only cut in one step and then write in another. Also you will have to buy the Cricut Explore Wireless Bluetooth Adaptor to be Bluetooth capable. In my opinion, since the Cricut Explore Air has come down in price, buy this one instead. Don’t even consider the Cricut Explore One unless you are buying one used. The extra price in the adaptor makes both of these machines around the same price. What Is the Cricut Expression 2 and Cricut Expression? These are older machines that had a keypad instead of a dial for settings. Instead of using Design Space to create they used the Craft Room-which I’ve read worked better when uploading larger image files on design space. You can still use these machines, but I wouldn’t recommend getting one. The Cricut Expressions are the oldie machines, similar in comparison to typewriters and printers. What’s the Cricut Cake Personal Electronic Cutter? Unless you are a cake decorator, you won’t need this machine for your craft creations. But, if you are in love with cake creations this machine is probably on your wish list! The Cricut Cake allows you to cut decorative shapes out of gum paste, fondant, frosting sheeps, and more! *want to know more about the Silhouette Cameo machine. Check out my post about a fabulous paper crafting momma here!